Tiles and wooden beams were removed from the Khan's Palace in Bakhchysarai allegedly within the framework of the "restoration"
Tiles and wooden beams, which the occupiers removed during the "reconstruction" from the Khan's Palace, were discovered on the territory of another monument of architecture in Bakhchysarai - Zıncırlı medrese, according to the ex-head of the Republican Committee of the ARC on interethnic relations and deported citizens, Crimean activist Edem Dudakov. “All who wish can visit the new Khan Palace’s burial ground on the territory of Zıncırlı medrese. Free admission. Souvenirs from artifacts are free. And the absolute silence ... Bow to the once majestic antiquities, while it is available. You can even take a picture for memory. Your grandchildren will not see the true story. For them, props are being prepared,” he wrote. Dudakov further noted that the "reconstruction" of the Khan Palace is being carried out by the contractor "Atta-group", which plans to replace the old handmade tiles with Spanish stylized ones. QHA reported that the occupiers in the Crimea with their actions in regard to the Khan Palace are violating the articles of the UNESCO convention. The only Crimean object, included in the UNESCO 2012 presentation project, is being turned into stylized props. 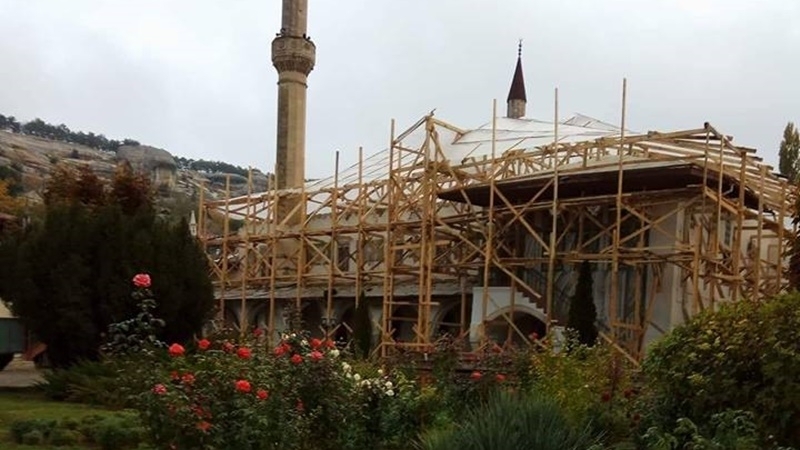 Earlier, the website Avaaz began collecting signatures in defense of the monument of the cultural heritage of the Crimean Tatar people - the Khan Palace in Bakhchysarai, which is being destroyed by Russia. The initiator of the petition was the secretary of the World Congress of the Crimean Tatars, the board member of the Crimean Tatar Association of Culture and Mutual Aid in Turkey Namık Kemal Bayar.